1. Curiosity. “What breed is your dog?” is often the #1 question owners of mixed breed dogs get asked. And most are never sure how to answer. A DNA test will serve to answer the question and satisfy the most curious of dog owners. 2. Training. Knowing the breeds in your dog is the key to understanding their personality traits. This allows dog owners to focus on the unique habits of their dog’s specific breed heritage when training and socializing the dog. Every breed comes with its own hereditary personality traits created from centuries of breeding. A dog with terrier breeds will require different training methods than a hound or a retriever mix. Each type of dog, and even each breed, has its own special triggers, which can be key to making sure your dog is properly trained. 3. Health. As the primary caregiver to your dog, knowing the genetic health risks associated with your dog’s breeds and discussing them with your veterinarian are vital to your dogs well being. One of the most important reasons to know the breeds in your dog is to make sure you are aware of the genetic health risks associated with these specific breeds. All breeds are susceptible to specific genetic health risks. Satisfy Your Curiosity! 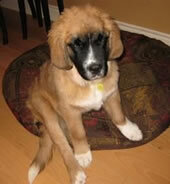 (Leonne Leclerc-Bergevin is a Level 2: Newfoundland and a Level 2: Saint Bernard). Ernie’s DNA My Dog Custom Certificate. Collecting a sample is simple! 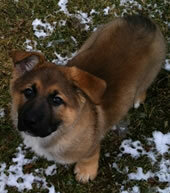 Bauer Benell believed to be a Labrador Retriever and DNA shows he is a German Shepherd/Great Dane mix. 4. Love. A DNA My Dog DNA test provides you with a registered ID number and a certificate of your dog’s own unique DNA genetic make-up. This certificate is suitable for framing and is a wonderful piece of history you can keep forever. We know you love your dog. At DNA My Dog we understand the special connection you have with your dog, we love our dogs, too. We have created a package of results you can be proud of. 5. Price. Only a few years ago the cost of DNA testing was well into the hundreds of dollars. With advances in processing and equipment, today’s DNA tests, especially those for dogs, are now more affordable than ever. A test that used to cost hundreds of dollars is now under $60. 6. Ease. Collecting cheek cell samples (buccal samples) is the most accurate and easy way of testing for DNA. For every critical application where DNA is required it is typically a cheek swab that is used. For example, if you are watching CSI on TV, the investigators take a cheek swab to match a suspects DNA to evidence found at a crime scene. Globally, DNA databases used for matching DNA have been built by using cheek swabs. Blood samples are simply not the only, or the preferred, way to collect DNA samples for forensics labs, the FBI or any other organization that routinely collects DNA. Knowing your dog’s breeds is key to their well-being. The cost and advances of DNA testing are always improving. It is impossible to accurately know breeds by physical appearance. (Cosmo is 100% German Shepherd Dog). 7. Fast. The same advances in technology that have brought down the price of DNA testing have also sped up the process. Historically results often took up to 6 weeks or more. Today, once our lab receives a sample, the DNA is immediately extracted and processed. Results are then validated and reported in less than two weeks. 8. Painless. Collecting a sample from your dog is easy and painless. The special provided polyester type swab is rubbed inside your dog’s cheek for about 20-30 seconds. This is done twice in case there is not enough DNA on each swab or more DNA is needed. The entire process takes under 2 minutes. 9. Confirmation. Often, dog owners are told their dog is a certain breed. In all but the most papered and registered dog this is inaccurate. Determining a breed by physical appearance is simply not a valid way of identifying breed make up. Many mixes can take on the physical characteristics of other breeds while not having the DNA of that breed at all. For example many Boxer and Labrador Retriever mixes can resemble German Shepherd and even Pit Bull type dog mixes. 10. Exciting. Having a DNA test on your dog is fun and exciting. Most of our clients are referred by friends and family who have done the test themselves. 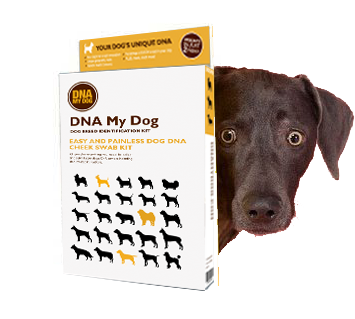 If you are curious or unsure of the breeds that make up your dog, try a DNA My Dog test today!